Armstrong’s linoleum collection comes with NaturCote, a top layer that increases resistance to scratches and scuffs and helps to maintain the floor’s appearance. 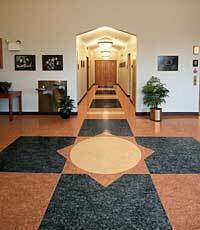 The finish has fewer microscopic places for dust or dirt to hide than unprotected linoleum. One of linoleum’s natural characteristics is the tendency to yellow from high pH cleaning solutions that might not discolor other commercial flooring. Applications of linoleum polish help protect linoleum’s surface, but wear off if not maintained properly, leaving the surface vulnerable to discoloration from harsh cleaning agents. But because NaturCote is bonded to the floor’s surface, the floor is protected from accidental exposure to high pH cleaners and stripping solutions, according to the company.